Equilibrium in the labor market requires that the marginal revenue product of labor is equal to the wage rate, and that MPL/PL=MPK/PK. Firms will hire more labor when the marginal revenue product of labor is greater than the wage rate, and stop hiring as soon as the two values are equal. The point at which the MRPL equals the prevailing wage rate is the labor market equilibrium. The marginal decision rule says that a firm will shift spending among factors of production as long as the marginal benefit of such a shift exceeds the marginal cost. If the marginal benefit of additional labor, MPL/PL, exceeds the marginal cost, MPK/PK, then the firm will be better off by spending more on labor and less on capital. According to the marginal decision rule, equilibrium in the labor market must occur where MPL/PL=MPK/PK. marginal product: The extra output that can be produced by using one more unit of the input. marginal revenue product: The change in total revenue earned by a firm that results from employing one more unit of labor. The labor market differs somewhat from the market for goods and services because labor demand is a derived demand; labor is not desired for its own sake but rather because it aids in producing output. Firms determine their demand for labor through a lens of profit maximization, ultimately seeking to produce the optimum level of output and the lowest possible cost. The marginal revenue product of labor (MRPL) is equal to the MPL multiplied by the price of output. The MRPL represents the additional revenue that a firm can expect to gain from employing one additional unit of labor – it is the marginal benefit to the firm from labor. Under the above assumptions, the MRPL is decreasing as the quantity of labor increases, and firms can increase profit by hiring more labor if the MRPL is greater than the marginal cost of that additional unit of labor – the wage rate. Thus, firms will hire more labor when the MRPL is greater than the wage rate, and stop hiring as soon as the two values are equal. The point at which the MRPL equals the prevailing wage rate is the labor market equilibrium. Optimal Demand for Labor: The optimal demand for labor is located where the marginal product equals the real wage rate. 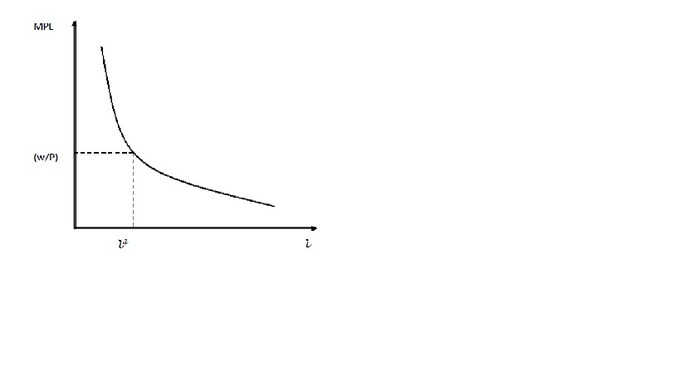 The curved line represents the falling marginal product of labor, the y-axis is the marginal product/wage rate, and the x-axis is the quantity of labor. In the long run, firms maximize profit by choosing the optimal combination of labor and capital to produce a given amount of output. It’s possible that an automobile company could manufacture 1,000 cars using only expensive, technologically advanced robots and machinery (capital) that do not require any human participation. It’s also possible that the company could produce the same number of vehicles using only employee work (labor), without any assistance from machines or technology. For most industries, however, relying solely on capital or solely on labor is more expensive than using some combination of the two. Factory Worker: Most firms need a combination of both labor and capital in order to produce their product. Firms use the marginal decision rule in order to decide what combination of labor, capital, and other factors of production to use in the creation of output. The marginal decision rule says that a firm will shift spending among factors of production as long as the marginal benefit of such a shift exceeds the marginal cost. Imagine that a firm must decide whether to spend an additional dollar on labor. To determine the marginal benefit of that dollar, we divide the marginal product of labor (MPL) by it’s price (the wage rate, PL): MPL/PL. If capital and labor are the only factors of production, then spending an additional $1 on labor while holding the total cost constant means taking $1 out of capital. The cost of that action will be the output lost from cutting back on capital, which is the ratio of the marginal product of capital (MPK) to the price of capital (the rental rate, PK). Thus, the cost of cutting back on capital is MPK/PK. If the marginal benefit of additional labor, MPL/PL, exceeds the marginal cost, MPK/PK, then the firm will be better off by spending more on labor and less on capital. On the other hand, if MPK/PK is greater than MPL/PL, the firm will be better off spending more on capital and less on labor. The equilibrium – the point at which the firm is producing the maximum amount of output at a given cost – occurs where MPL/PL=MPK/PK. The wage rate is determined by the intersection of supply of and demand for labor. An increase in demand or a reduction in supply will raise wages; an increase in supply or a reduction in demand will lower them. The demand curve depends on the marginal product of labor and the price of the good labor produces. If the demand curve shifts to the right, either because productivity or the price of output has increased, wages will be pushed up. In the long run the supply of labor is simply a function of the population size, but in the short run it depends on variables such as worker preferences, the skills and training a job requires, and wages available in alternative occupations. When labor is an input to production, firms hire workers. Firms are demand labor and workers provide it at a price called the wage rate. Colloquially, “wages” refer to just the dollar amount paid to a worker, but in economics, it refers to total compensation (i.e. it includes benefits). The marginal benefit of hiring an additional unit of labor is called the marginal product of labor: it is the additional revenue generated from the last unit of labor. In theory, as with other inputs to production, firms will hire workers until the wage rate (marginal cost) equals the marginal revenue product of labor (marginal benefit). Technology which affects the output of a unit of labor. Changes in the price of the output which affect the value of the unit of labor. Changes in the price of labor relative to other factors of production. In the long run, the supply of labor is a function of the population. A decrease in the supply of labor will typically cause an increase in the wage rate. The fact that a reduction in supply tends to strengthen wages explains why unions and other professional associations have often sought to limit the number of workers in their particular industry. Physicians, for example, have a financial incentive to enforce rigorous training, licensing, and certification requirements in order to limit the number of practitioners and keep the labor supply low. Wage Rate in the Long Run: In the long run the supply of labor is fixed and demand is downward-sloping. The wage rate is determined by their intersection. Some differences in wage rates across places, occupations, and demographic groups can be explained by compensation differentials. Although basic economic theory suggests that there ought to be one prevailing wage rate for all labor, this is not the case. Wage differences are called compensation differentials and can be explained by many factors, such as differences in the skills of the workers, the country or geographical area in which jobs are performed, or the characteristics of the jobs themselves. One common source of differences in wage rates is human capital. More skilled and educated workers tend to have higher wages because their marginal product of labor tends to be higher. If a certain area is a desirable place to live, the supply of labor will be higher than in other areas and wages will be lower. This is a type of geographical differential. Discrimination against gender or racial groups can cause compensation differentials. A compensating differential is the additional amount of income that a given worker must be offered in order to motivate them to accept a given undesirable job, relative to other jobs that worker could perform. discrimination: Distinct treatment of an individual or group to their disadvantage; treatment or consideration based on class or category rather than individual merit; partiality; prejudice; bigotry. According to the basic theory of the labor market, there ought to be one equilibrium wage rate that applies to all workers across industries and countries. Of course this is not the case; doctors typically make more per hour than retail clerks, and workers in the United States typically earn a higher wage than workers in India. These wage differences are called compensation differentials and can be explained by many factors, such as differences in the skills of the workers, the country or geographical area in which jobs are performed, or the characteristics of the jobs themselves. One common source of differences in wage rates is human capital. More skilled and educated workers tend to have higher wages because their marginal product of labor tends to be higher. Additionally, the differential pay for more education tends to compensate workers for the time, effort, and foregone wages from obtaining the necessary training. If all jobs paid the same rate, for example, fewer people would go through the expense and effort of law school. The compensation differential ensures that individuals are willing to invest in their own human capital. If a certain part of a country is a particularly attractive area to live in and if labor mobility is perfect, then more and more workers will move to that area, which in turn will increase the supply of labor and depress wages. If the attractiveness of that area compared to other areas does not change, the wage rate will be set at such a rate that workers will be indifferent between living in areas that are more attractive but with a lower wage and living in areas which are more attractive with a higher wage. In this way, a sustained equilibrium with different wage rates across different areas can occur. In the United States, minorities and women make lower wages on average than Caucasian men. Some of this is due to historical trends affecting these groups that result in less human capital or a concentration in certain lower-paying occupations. Another source of differing wage rates, however, is discrimination. Several studies have shown that, in the United States, several minority groups (including black men and women, Hispanic men and women, and white women) suffer from decreased wage earning for the same job with the same performance levels and responsibilities as white males. Not to be confused with a compensation differential, a compensating differential is a term used in labor economics to analyze the relation between the wage rate and the unpleasantness, risk, or other undesirable attributes of a particular job. It is defined as the additional amount of income that a given worker must be offered in order to motivate them to accept a given undesirable job, relative to other jobs that worker could perform. One can also speak of the compensating differential for an especially desirable job, or one that provides special benefits, but in this case the differential would be negative: that is, a given worker would be willing to accept a lower wage for an especially desirable job, relative to other jobs.. Hazard Differential: Hazard pay is a type of compensating differential. 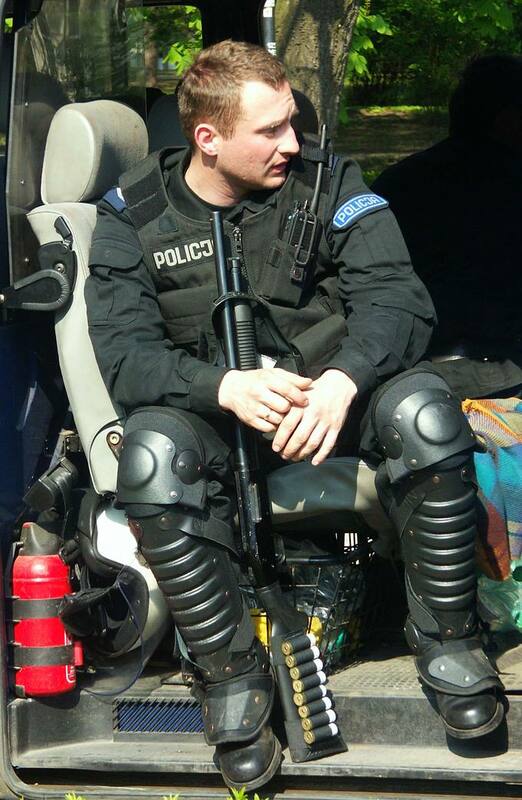 Occupations that are dangerous, such as police work, will typically have higher pay to compensate for the risk associated with that job. Theoretically there is a direct connection between job performance and pay, but in reality other factors often distort this relationship. According to economic theory, workers’ wages are equal to the marginal revenue product of their labor. If one employee is very productive he or she will have a high marginal revenue product. In reality, wages are determined not only by one’s productivity, but also by seniority, networking, ambition, and luck. Some of the disconnect between performance and pay can be addressed with alternate pay schemes. piece work: Work that a worker is paid for according to the number of units produced, rather than the number of hours worked. According to economic theory, workers’ wages are equal to the marginal revenue product of their labor. If one employee is very productive he or she will have a high marginal revenue product: one additional hour of their work will produce a significant increase in output. It follows that more productive employees should have higher wages than less productive employees. Imagine if this were not true: a firm decides to pay a highly productive worker less than the marginal revenue product of his labor. Any other firm could make a profit by offering a higher salary to attract the productive employee to their company, and the worker’s wage would rise. Theoretically, therefore, there is a direct relationship between job performance and pay. We know that this is not always the case in reality. Wages are determined not only by one’s productivity, but also by seniority, networking, ambition, and luck. It is very rare for an entry-level worker to make the same wage as an experienced member of the same profession regardless of their relative levels of productivity because the older worker has had time to receive pay raises and promotions for which the younger employee is simply not eligible. Discrimination is sometimes responsible for members of minority racial or gender groups receiving wages that are less than wages for the majority group even when productivity levels are the same. Finally, outside forces, such as unions or government regulations, can distort pay rates. 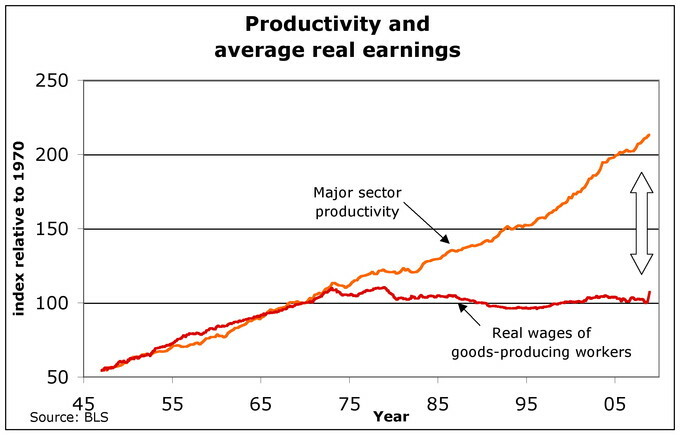 Wages and Productivity in the U.S.: On a macroeconomic level, this graph shows the disconnect, beginning around 1975, between the productivity of labor and the wage rate in the U.S. If the economic theory were correct in the real world, wages and productivity would increase together. Some of the disconnect between performance and pay can be addressed with alternate pay schemes. While a salary or hourly pay does not directly take into account the quality of work, performance-related pay compensates workers with higher levels of productivity directly. One example is commission-based pay. In this type of pay scheme, workers receive some percentage of the profit that they generate for their company. This may be paid on top of a baseline salary or may be the only form of compensation. This type of system is very common among car salespeople and insurance brokers. Another alternative is piece-work, in which employees are paid a fixed rate for every unit produced or action performed, regardless of the time it takes. This is common in settings where it is easy to measure the output of piece work, such as when a garment worker is paid per each piece of cloth sewn or a telemarketer is paid for every call placed. In a perfectly competitive market, the wage rate is equal to the marginal revenue product of labor. In the long run the supply of labor is a simple function of the size of the population, so in order to understand changes in wage rates we focus on the demand for labor. The marginal product of labor (MPL) is the increase in output that a firm experiences from adding one additional unit of labor. The marginal benefit to the firm of hiring an additional unit of labor is called the marginal revenue product of labor (MRPL). It is calculated by multiplying MPL by the price of the output. The MRPL represents the firm’s demand curve for labor, which means that the firm will continue to hire more labor until the MRPL is equal to the wage rate. marginal benefit: The extra benefit received from a small increase in the consumption of a good or service. It is calculated as the increase in total benefit divided by the increase in consumption. Just as in any market, the price of labor, the wage rate, is determined by the intersection of supply and demand. When the supply of labor increases the equilibrium price falls, and when the demand for labor increases the equilibrium price rises. In the long run the supply of labor is a simple function of the size of the population, so in order to understand changes in wage rates we focus on the demand for labor. To determine demand in the labor market we must find the marginal revenue product of labor (MRPL), which is based on the marginal productivity of labor (MPL) and the price of output. Conceptually, the MRPL represents the additional revenue that the firm can generate by adding one additional unit of labor (recall that MPL is the additional output from the additional unit of labor). Thus, MRPL is simply the product of MPL and the price of the output. The MPL is generally decreasing: adding a 100th unit of labor will not increase output as much as adding a 99th. Since competitive industries are price takers and cannot change the price of output by changing their level of production, the MRPL curve will have the same downward slope as the MPL curve. From the perspective of the firm, the MRPL is the marginal benefit to the firm of hiring an additional unit of labor. We know that a profit-maximizing firm will increase its factors of production until their marginal benefit is equal to the marginal cost. Therefore, firms will continue to add labor (hire workers) until the MRPL equals the wage rate. Thus, workers earn a wage equal to the marginal revenue product of their labor. For example, in a perfectly competitive market, an employee who earns $20/hour has a marginal productivity that is worth exactly $20. Marginal Product and Wages: The graph shows that a factor of production – in our case, labor – has a fixed supply in the long run, so the wage rate is determined by the factor demand curve – in our case, the marginal revenue product of labor. The intersection of vertical supply and the downward sloping demand gives the wage rate. A shift in the supply or demand of labor will cause a change in the market equilibrium. The opportunity cost of leisure is the wages lost while not working; as wages rise, the cost of leisure increases. The substitution effect means that when wages rise, people are likely to substitute more labor for less leisure. However, the income effect means that as people become wealthier, their demand for normal goods such as leisure increases. Typically the substitution effect dominates the supply of labor at normal wage rates, but the income effect may come to dominate at higher wage rates. This creates a backward bending labor supply curve. The supply curve for labor will shift in response to changes in preferences, changes in income, changes in population, and changes in expectations. The demand curve for labor will shift in response to changes in human capital, changes in technology, changes in the price of complements or substitutes for output, and changes in consumer preferences. normal good: A good for which demand increases when income increases and falls when income decreases but price remains constant. 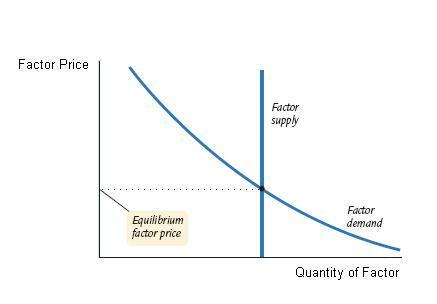 As in all competitive markets, the equilibrium price and quantity of labor is determined by supply and demand. 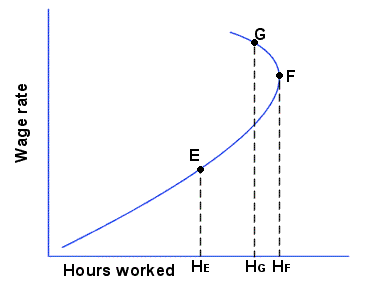 Labour supply curves are derived from the ‘labor-leisure’ trade-off. More hours worked earn higher incomes but necessitate a cut in the amount of other things workers enjoy such as going to movies, hanging out with friends, or sleeping. The opportunity cost of working is leisure time and vis versa. Considering this tradeoff, workers collectively offer a set of labor to the market which economists call the supply of labor. To see how changes in wages affect the supply of labor, suppose wages rise. This increases the cost of leisure and causes the supply of labor to rise – this is the substitution effect, which states that as the relative price of one good increases, consumption of that good will decrease. However, there is also an income effect – an increased wage means higher income, and since leisure is a normal good, the quantity of leisure demanded will go up. In general, at low wage levels the substitution effect dominates the income effect and higher wages cause an increase in the supply of labor. At high incomes, however, the negative income effect could offset the positive substitution effect and higher wage levels could actually cause labor to decrease. A worker making $800/hour who receives a raise to $1200/hour may not have much use for the extra money and may choose to work less while maintaining the same standard of living, for example. This creates a supply curve that bends backwards, initially increasing with the wage rate but later decreasing. Backward Bending Supply: While normally hours of labor supplied will increase with the wage rate, the income effect may produce the opposite effect at high wage levels. People supply labor in order to increase their utility —just as they demand goods and services in order to increase their utility. The supply curve for labor will shift in response to changes in the same factors that shift demand for goods and services. These include changes in preferences, changes in income, changes in population, and changes in expectations. A change in preferences that causes people to prefer more leisure, for example, will shift the supply curve to the left, creating a lower level of employment and a higher wage rate. All of the above may cause the demand for labor to shift and change the equilibrium quantity and price of labor. Unions are organizations of workers that seek to improve working conditions and raise the equilibrium wage rate. Unions ‘ primary work involves negotiating wages, work rules, complaint procedures, promotions, benefits, workplace safety and policies with company management. If the labor market is a competitive one in which wages are determined by demand and supply, increasing the wage requires either increasing the demand for labor or reducing the supply. Increasing demand for labor requires increasing the marginal product of labor or raising the price of the good produced by labor. Unions can restrict the supply of labor in two ways: slowing the growth of the labor force and promoting policies that make it difficult for workers to enter a particular craft. collective bargaining: A method of negotiation in which employees negotiate as a group with their employers. strike: A work stoppage (or otherwise concerted stoppage of an activity) as a form of protest. minimum wage: The lowest rate at which an employer can legally pay an employee; usually expressed as pay per hour. A labor union is an organization of workers who have banded together to achieve common goals. The primary activity of the union is to bargain with the employer on behalf of union members and negotiate labor contracts. The most common purpose of associations or unions is maintaining or improving the conditions of employment, which may include the negotiation of wages, work rules, complaint procedures, promotions, benefits, workplace safety, and policies. In order to achieve these goals unions engage in collective bargaining: the process of negotiation between a company’s management and a labor union. When collective bargaining fails, union members may go on strike, refusing to work until a firm addresses the workers’ grievances. Fundamentally, unions seek higher wages for its member workers (though, here “wages” encompases all types of compensation, not just cash paid to the workers by the employer). The effect of unions on the labor market equilibrium can be analyzed like any other price increase. If employers (those who demand labor) have an inelastic demand for labor, the increase in wages (the price of labor) will not translate into a drop in employment (quantity of labor supplied). If, however, their demand is elastic, employers will simply respond to union demands for higher wages by hiring fewer workers. However, the reality of unions is more complex. As an organized body, unions are also active in the political realm. They can lobby for legislation that will affect the market not only for labor, but also for the goods they produce. For example, unions may advocate for trade restrictions to protect the markets in which they work from foreign competition. 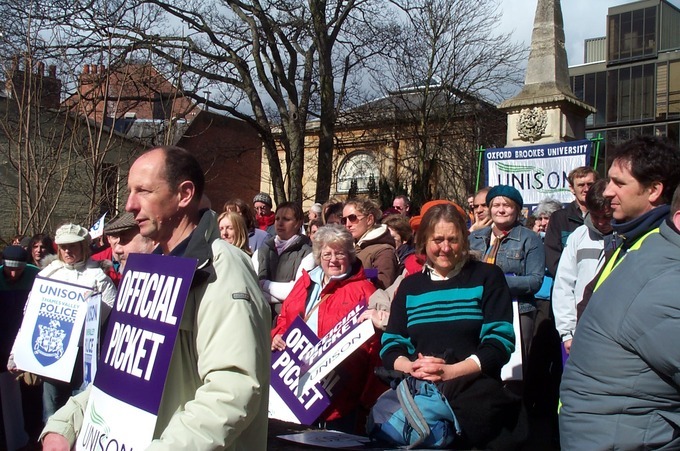 By preventing domestic firms from having to compete with unrestricted foreign firms, they can ensure that consumers do not have lower cost alternatives which would drive employers who pay a higher union wage out of business. Union Members Strike: One tool that unions may use to raise wages is to go on strike.